If you’re a local, this photo will trigger a flood of memories. 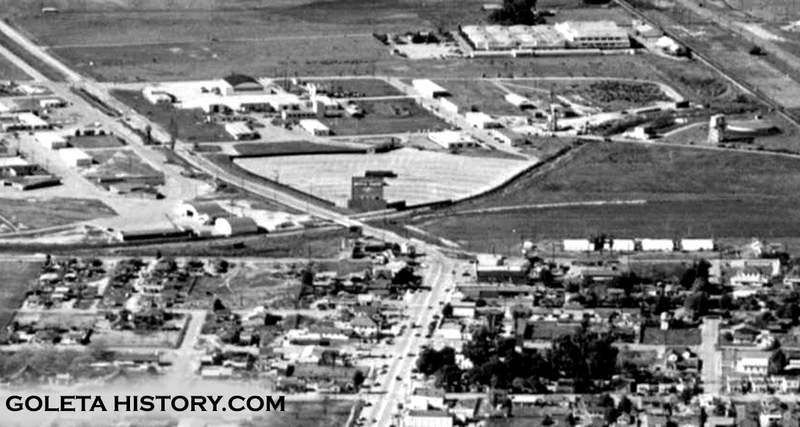 This is the corner of Hollister and Fairview looking towards the airport in the late 1960’s. Gas at Bob’s Seaside service station was 27 cents a gallon, and recaps were $9.95. Swingers Golf Center was in full swing and the newly opened Ski Lodge Coffee Shop brought some interesting architecture to Hollister Avenue. 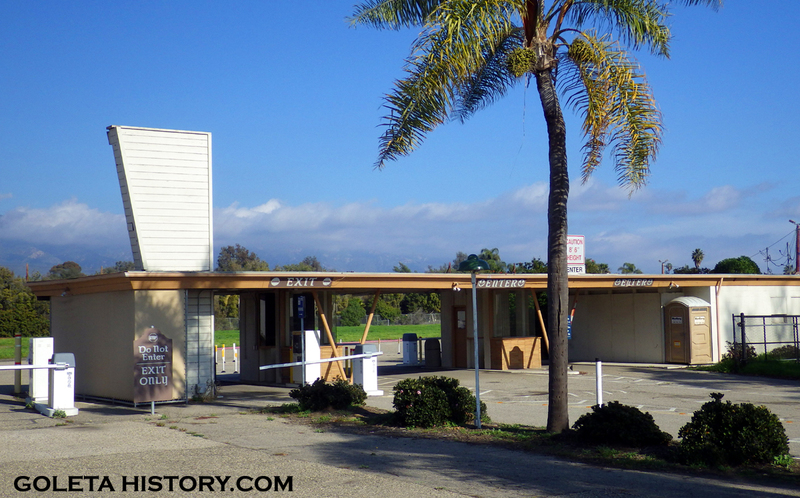 But this place, the Airport Drive In, was of utmost importance to Baby Boomers growing up in Goleta. It was where millions of happy memories were made. Photos of this place in its heyday are hard to come by, so when we heard Mike McLean had this picture hanging in his office at McLeans Auto Body, we had to go see it. This sign at night was a sight to behold. The airplane was lit up and the propellers spun around, a neon masterpiece. 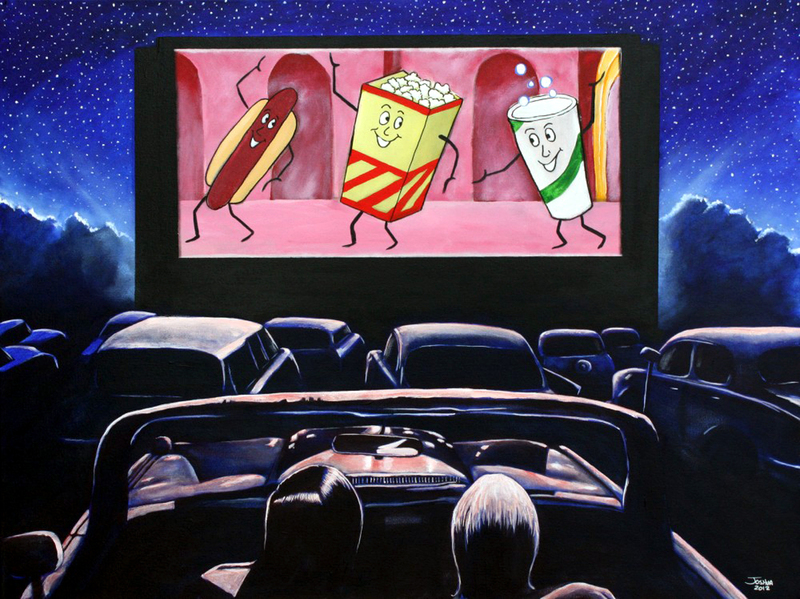 Today, drive-in theaters are a novelty and a place for swap meets, but from the 1950’s through the 1970’s, they were a family event and an adolescent escape. Great for young families, kids loved the playground and the chance to hang out with friends at night. Parents loved that they could put the kids in their pajamas and watch a movie in the comfort of their own vehicle, and it was affordable! In between movies, a classic old cartoon prompted you to go to the snack bar to get some delicious treats. And hordes of kids in pajamas would swarm the playground again. 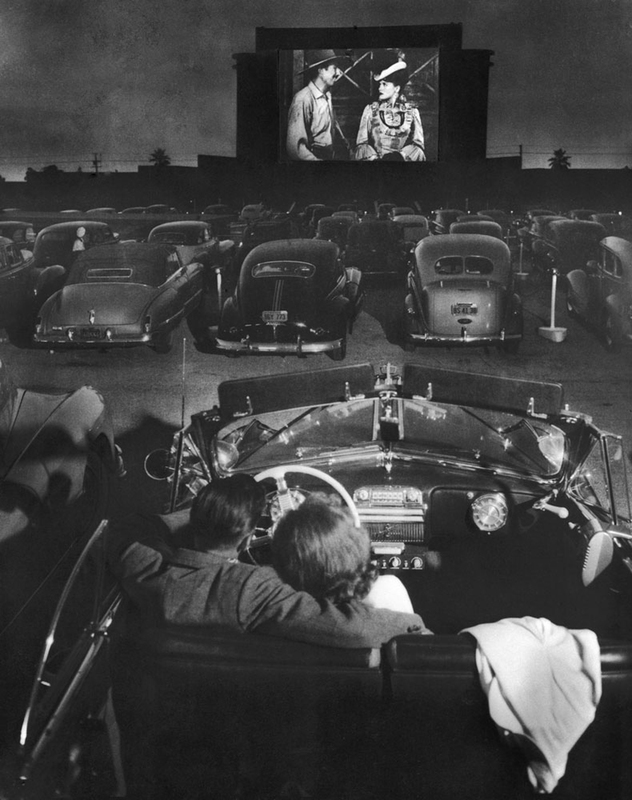 Teenagers found drive-ins ideal for dates, offering more privacy than a regular theater. So much so, in fact, that they soon got labeled “passion pits” by some. 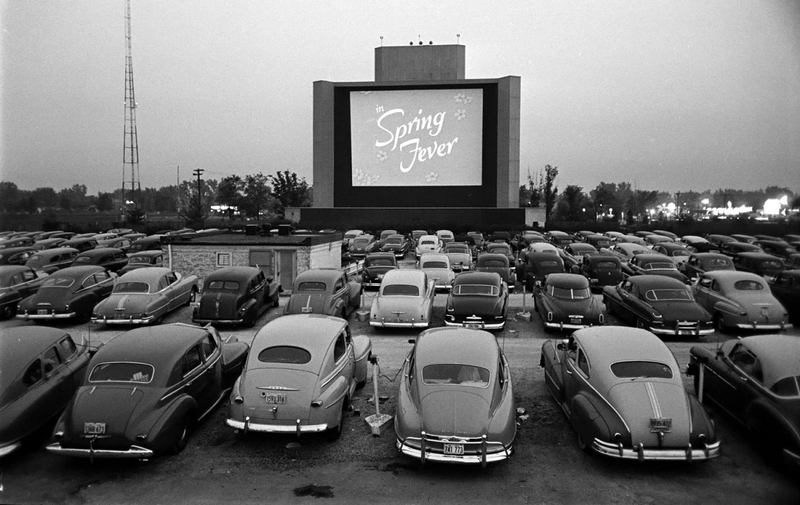 Drive-ins were not as profitable as regular theaters, however, because they could only show movies at night, and it was common practice to hide your friends in the trunk. 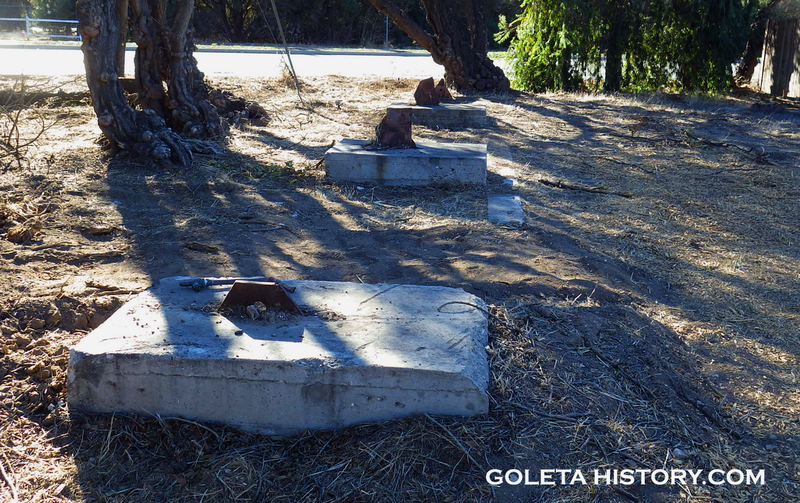 In Goleta, some folks remember sneaking in through a hole in the fence with a date and a blanket and watching the movie lounging on the grass just below the screen. Talk about a cheap date! According to Walker Tompkins, the first “drive-in theater” in our area was on State Street in 1912. During the presidential election, a large white screen was hung on a building and election returns were projected from the roof of a building across the street. 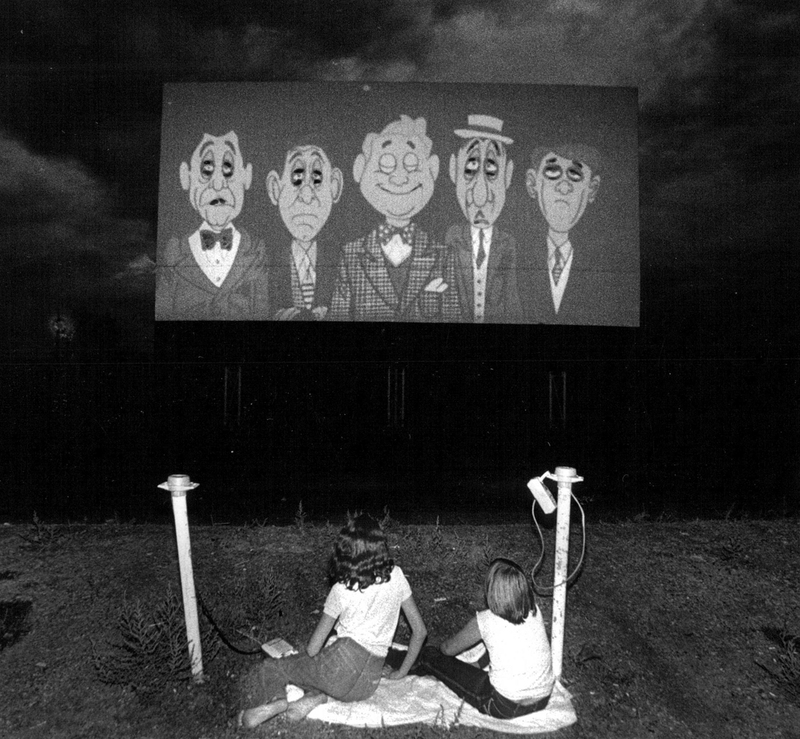 Between updates, movies were shown to keep the crowd entertained. Seeing how well this went, a local merchant began showing free movies nightly on a giant white board erected behind a building at State and Ortega. 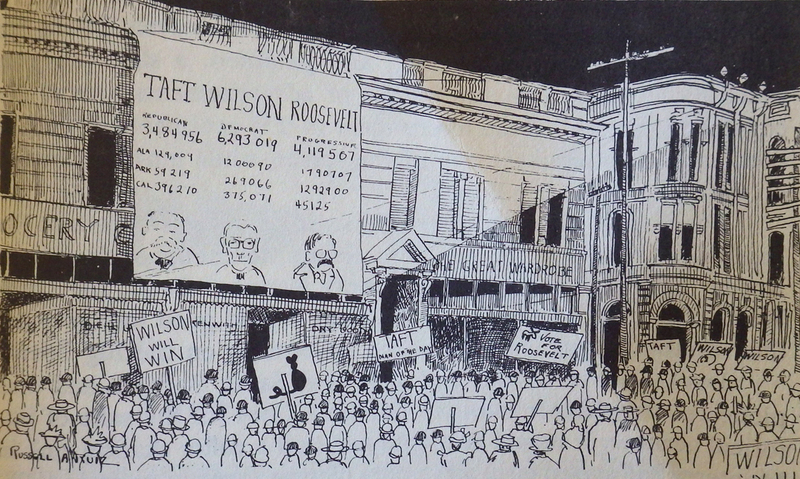 While admission was free, the entertainment was peppered with local advertisements. Another outdoor theater, that charged admission, briefly operated on a hillside in Santa Barbara, but it was impossible to keep freeloaders from watching from further up the hill, so it soon closed. 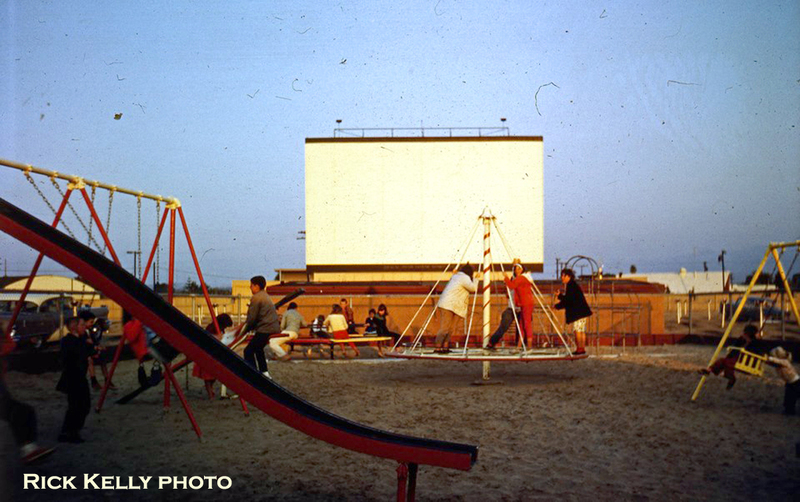 The only earlier outdoor movie known of in California was in Monterey in 1908. 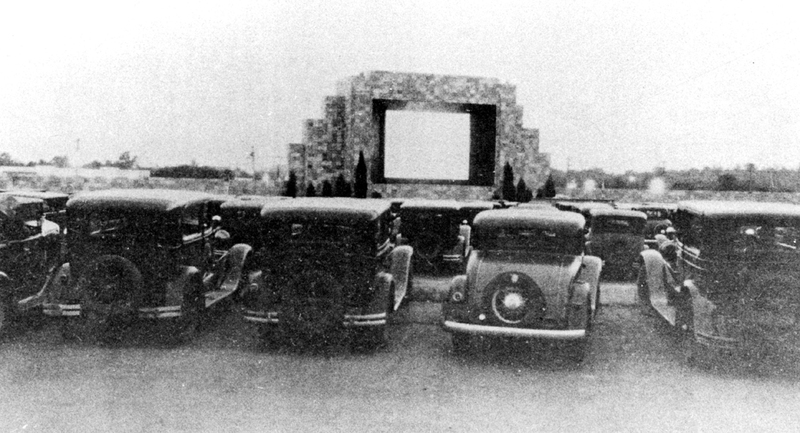 The first automobile drive-in theater opened in New Jersey in1933. Their slogan was “The whole family is welcome, regardless of how noisy the children are.” It was a financial failure, and the owner sold out, but the idea was good and the trend eventually caught on nationwide. 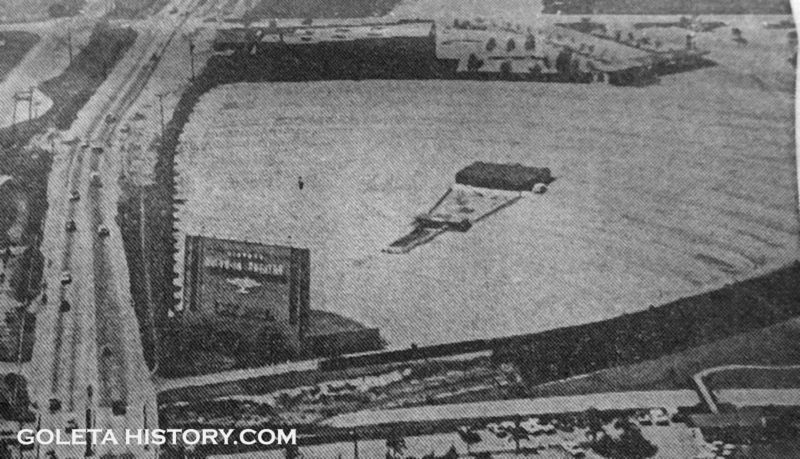 During World War II, this was how the lot looked that would soon be the Airport Drive-in. Surrounded by the Marine base, it was already the perfect shape! 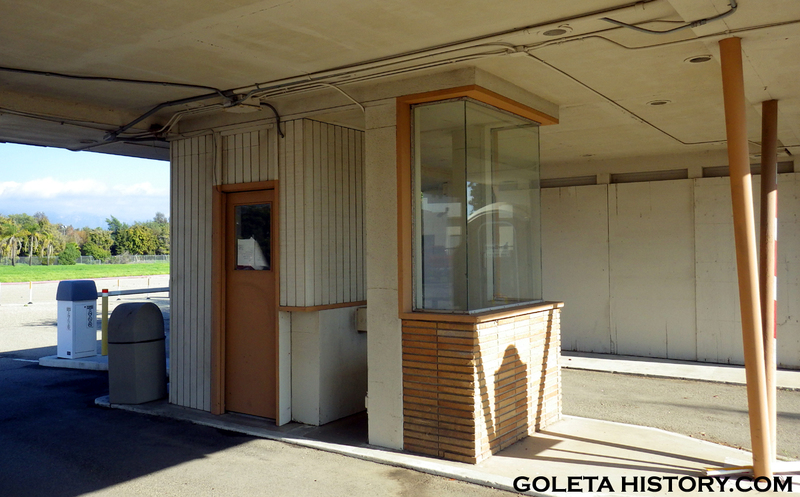 The Airport Drive-in opened in April 1951 with enough room for 700 cars, putting Goleta on the entertainment map for Santa Barbara County. Lots of folks remember parking on Hollister in the 1950’s, when the bushes were still small, and watching the show from the side of the road. It was so quiet you could hear the sound from the speakers. 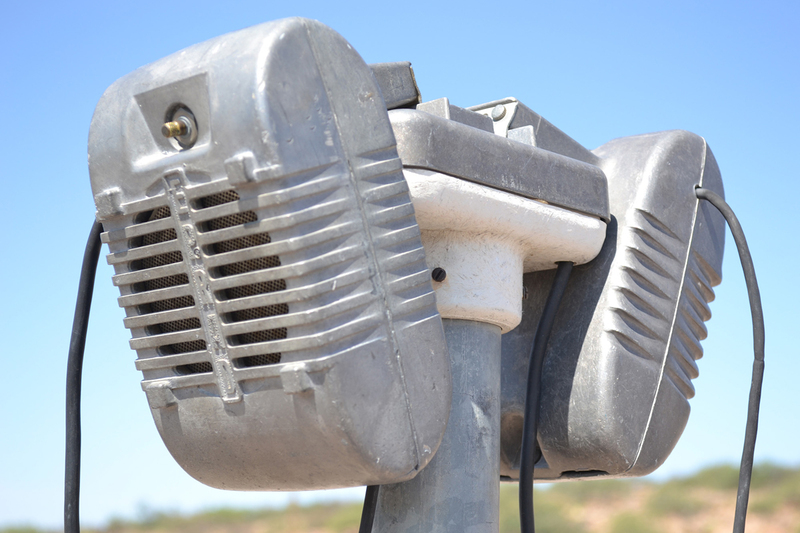 Modern Drive-in patrons probably have no idea what these are, but how many of us remember the poor sound quality these speakers delivered. And how many of us accidentally started to drive off before we removed them from our window…. We recently found these quality photos from 1953. A good shot of the neon airplane. 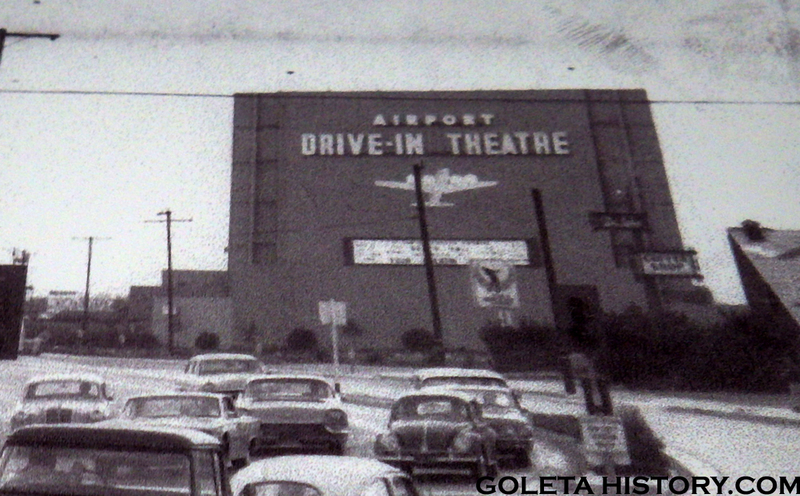 Here is a photo of the Airport Drive-in in 1959. 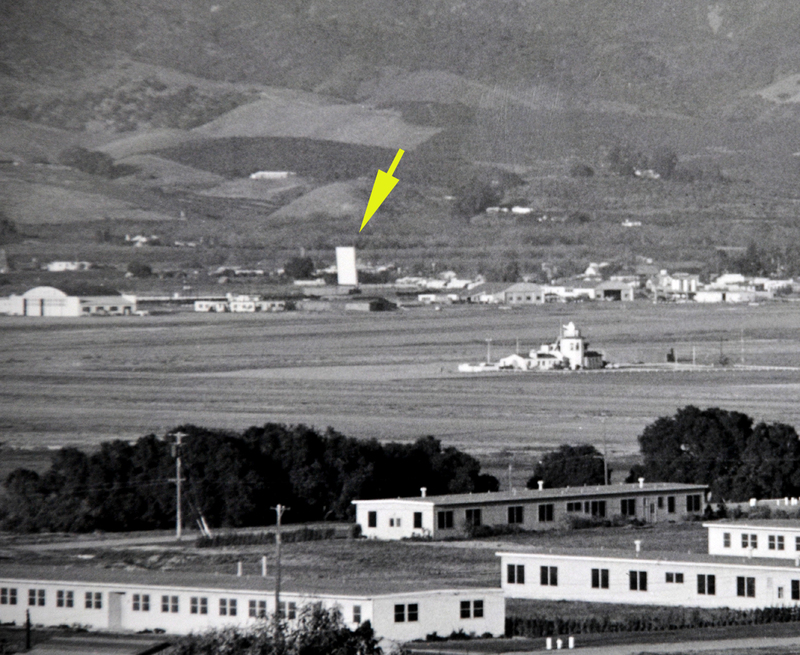 The buildings in the foreground were Marine barracks, at this time being used by the newly formed UCSB. Also notice the Airport terminal and the original two hangars, mid photo on the right. 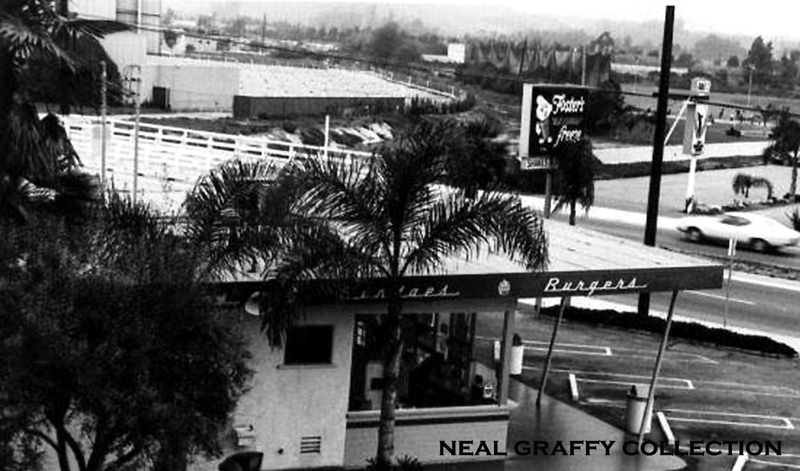 This great photo from the late 1960’s shows the Foster’s Freeze that was across the street, with part of Airport Drive-in visible in the upper left. The Swingers sign is also in view on the right. By the late 1990’s, the Airport Drive-in went out of business. 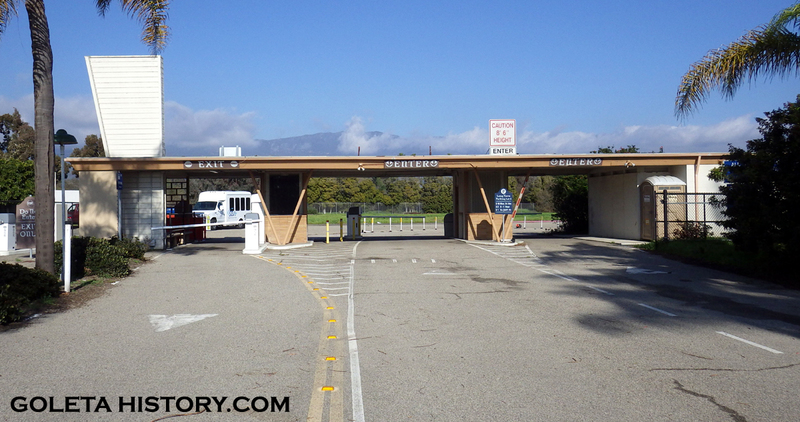 Today, the old drive-in serves as a parking lot for the Santa Barbara airport. All that’s left of the screen with the big neon airplane are these concrete slabs. But the entry gate and office still stand with its vintage 1950’s architecture on full display. 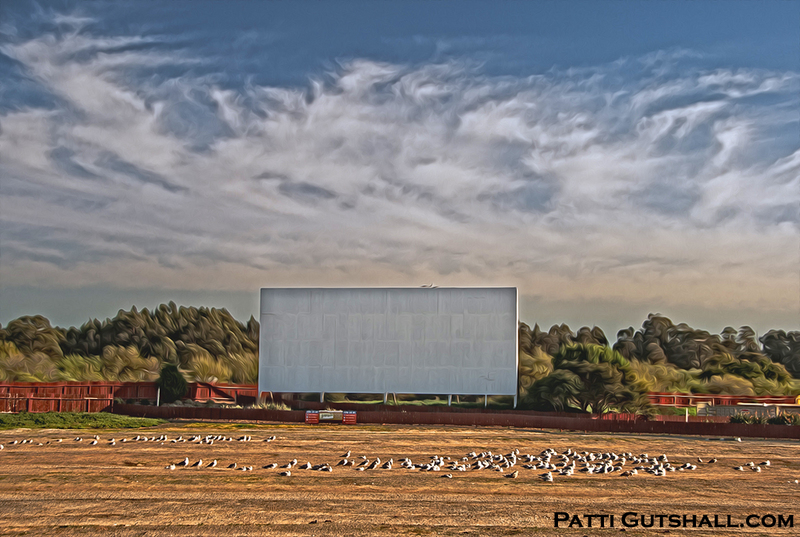 You can, however, still go to a drive-in movie in Goleta . 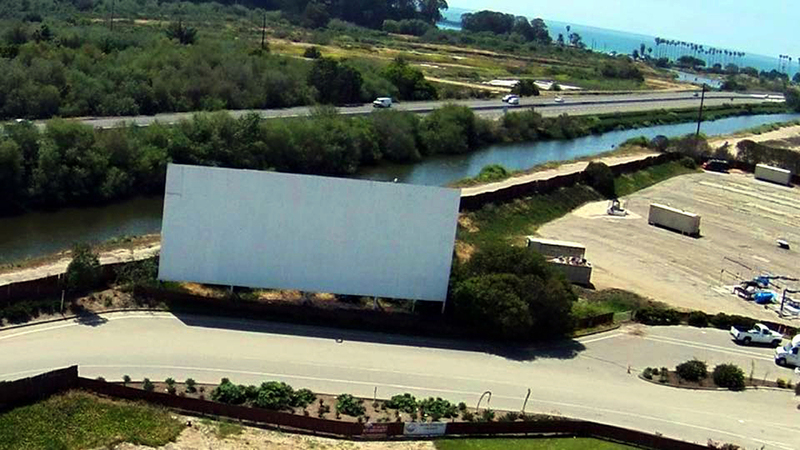 Formerly known as the Twin Screens Drive-in, the Santa Barbara Drive-in is still open on South Kellogg Avenue. It’s still as much fun as ever, and a great experience for kids too young to remember the old days. But for us old timers, nothing can compare to the good old days at the Airport Drive-in. Thank you!!! I never got to go to the Airport Drive-In. I lived in Solvang and we drove by it a lot! Your photos are fabulous! I am 77 now and have time to look back! Tom, you and I traveled through this area many times on bikes on our way to The Point. 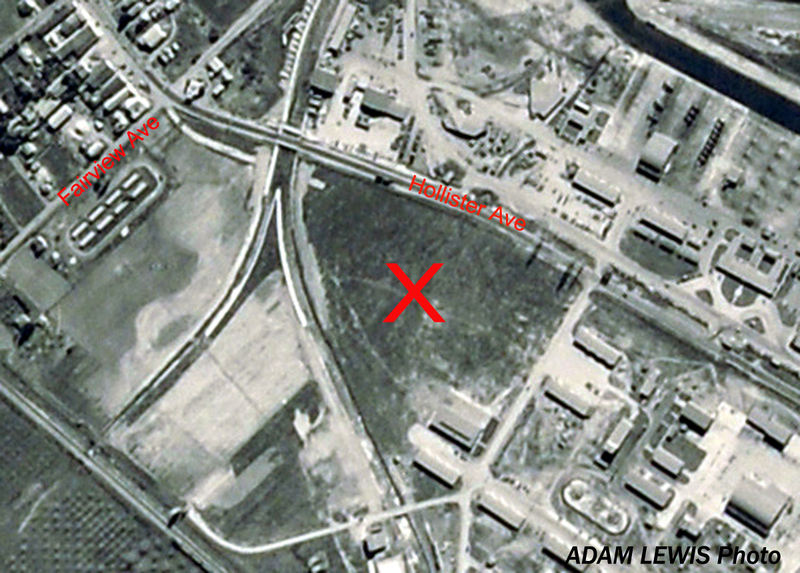 Many of us hold decades of fond memories of the Airport Drive-In and that intersection. Back in a time when at least four VW Bugs would be at a stop light. The Shell station gave out presidential coins and McDonalds opened with a big celebration. Thank you for the write-up on this local landmark. Great research. Indeed we did Ken. We were lucky to grow up where we did, when we did. Great to hear from you! Back when we had the “March Miracle” rains the drive in was being used for airport parking but had not been repaved flat and still had the raised rows for watching movies. Luckily I parked on one of the high spots when I left on my trip before the rain. When I returned the airport was closed (still flooded) and when I went to get my truck from the drive in lot the water line was up to my axles. Many small cars that were closer to the flood control channel had floated and were piled up near the screen corner. I was able to drive out through the mud. Great Memories of this Drive-In. My older brother used pile myself and bunch of other kids in his Ford Station Wagon for the $1.75 a car load nights! Sometimes they would show 3 movies, so we were up all night practically. Loved the neon airplane sign. It was removed I believe in the late 70’s. Rumor had it that it caused confusion/ problems with incoming flights to the airport. Any truth to that story? This made me think of the old motel near the airport, pilot motel? It was there when I first moved here in the early 2000’s, it was pretty sad looking and then it disappeared. I’ve tried looking for old pictures or mentions of this place without any luck, I need to prove to myself that it actually existed and I didn’t imagine it! Oh yes, it existed! Doubt if there are any photos though. It was actually the Pilot House, and many a high school partys were held there as well….Read the comments on the Guppys page of Goleta History. Another guy that lived there wrote about the motel. Thank you for the fond memories, it brought tears of sadness and joy. All the fun times and now it’s gone. Our family would pile in the Vega station wagon (lol) , and being the oldest ,when we got there I could head to the playground. Don’t really remember watching the movies ! When I got older and got a car , use to meet my friends there and goof off. Still don’t remember watching any movies ! I used to work at the Airport Drive-in in the mid 1960s and eventually became the snack bar manager. It was a lot of fun working there. Later after getting married my wife Kay and I with our kids would get grinder/sub sandwiches at Petrinis (I believe that was the name) in Goleta and take them to the Drive-in to eat while watching the movies. Heck, If I remember right, I think I worked there and “made it” to assistant manager! I never made a bust of illegal trunksters or fence jumpers, or for that matter, an employee candy bar thief. Although, I do remember a friend hopping into the employee’s only section whom I knew from Low School and Santa Cruz Market whom I decidedly tossed over the stale popcorn stand(not really but sort of) In which S.A, Karen never gave me an atta boy…yet fired me for smoking out the office and leaving a roll of quarters in an unlocked safe. Haha! I remember laying face down in a popcorn vat and just chewing…among other activities.. I used to work at the Airport Drive-in Theater about 1964 to 1966. I worked my way up to snack bar manager. I was going to Brooks Institute of Photography at that time and worked at the drive-in at night. You’re welcome, You’re lucky I didn’t toss ya into the 3 day old hamburger bin. Being kind I also never busted any gate crashers(I knew them all) as I knew, in my official duties, that doing so would thwart other fun and profit from “High” DP. So instinctively I did the right thing except for the clandestine smok’in thing…that S A Karen miraculous sleuthing uncovered. The key to S.A. Karen physiology lies in the hands of, one, George T.